Mafi Timber Flooring was specified for a recently converted Victorian terrace home located in Balmain in Sydney’s Inner West. 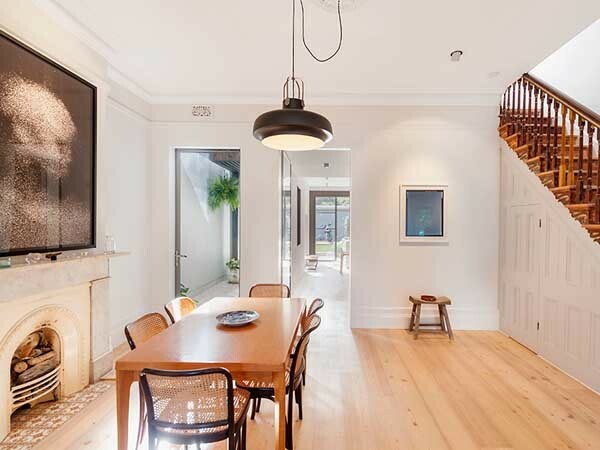 The owners worked with Darren Woodman of Woodman Architects to create a spectacularly light and airy home wherein classic elements of the existing terrace were maintained and a Scandinavian inspired theme was beautifully integrated. The owners sought to retain all the ornate features of the Victorian terrace home including the high ceilings, skirting, cornices, ceiling roses and iron lace. Simple, contemporary features including Mafi timber floors and thin steel industrial doors and windows were incorporated to enhance the space. Mafi timber floors were selected by the homeowners for their beautiful oil finishes and the high quality of the solid three-layer boards. In addition to the clean aesthetic, the Mafi floors would also help them achieve a natural and healthy home, without harmful lacquer or toxins. Mafi Larch Brushed White Oil was selected for its unique surface appearance. The light colour and striking grain characteristic of Mafi’s Austrian Larch plays in wonderfully with the minimalistic Scandinavian design. According to the owners, the floor achieved the clean and crisp aesthetic they wanted and brought a lot more light into a normally dark terrace layout. For more info on creating a healthy home or work environment, read this white paper Considering the impact of indoor air quality on health.